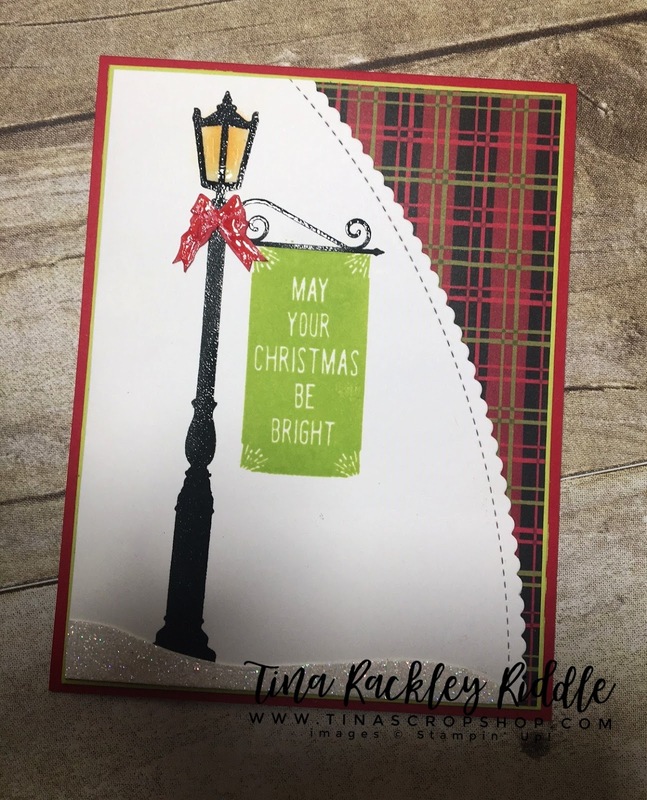 Tina's Crop Shop: PCC #264 Color Challenge with Stampin' Up! Brightly Lit Christmas! PCC #264 Color Challenge with Stampin' Up! Brightly Lit Christmas! Hello and Happy Hump Day! I always feel like when I've made it to Wednesday I can get through the rest of the work week. This weekend will be another trip to Knoxville to see three of our granddaughters. That's something to look forward to for sure! 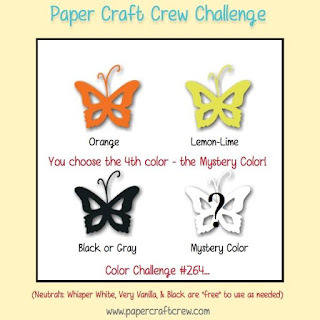 Well of course since it is Wednesday that means another Paper Craft Crew Challenge. This week's card is for a color challenge. I have to tell you that at first I wasn't feeling it. I've made so many Halloween and Fall cards and I really didn't want to go in that direction. The great thing about this color challenge is that we can pick a mystery color to add to the mix.. well I wanted to make a Christmas card so I went with Red! During World Card Making Day, I bought the Stampin' Up! Brightly Lit Christmas stamp set as one of their specials so of course I had to use it! The light post and sign holder were stamped in Versafine Black Onyx and clear embossed on a 4 x 5 1/4" piece of Whisper White Cardstock. I used a sponge with a small amount of Pumpkin Pie Ink on it to sponge the light in the light post. The sign was stamped in Lemon Lime Twist directly under the sign holder. MFT Die-namic Stitched Scallop Basic Edges Dies were used to cut a curved edge on the panel. I mounted the panel on a 4" x 5 1/4" piece of plaid DSP from the Christmas Around the World DSP pack. I then mounted that onto a piece of Lemon Lime Twist that measured 4 1/8" x 5 3/8" and attached that to a Real Red top folding Card Base. I decided the lamp post needed the bow from the stamp set so I stamped it in Real Red on a scrap of white cardstock. The bow was fussy cut and a Real Red marker's brush tip was used to color the edges so no white was showing. I added a strip of White Glimmer paper hand cut like a snow bank to the bottom of the white panel to ground my light post. To finish this off I used some Journey Glaze to cover the bow as well as the glass on the lantern. I really love how this one turned out. I've been struggling with Lemon Lime Twist so I was glad to be able to use it on a Christmas Card and feel good about it. That color was just a bit of a stretch for me. SIP Challenge #122 Product Feature - Washi Tape! OSAT Blog Hop - Fall/Halloween!